• MnDOT doesn’t explicitly prioritize funding and policies that expand public transit, bicycling, and walking—but they should. These options will reduce greenhouse gases and other emissions, expand affordable access and promote equity, and respond to the state’s changing demographics. • MnDOT still needs to implement better performance measures for modes other than driving.The current plan continues to put too much emphasis on the speed/delay of car travel. For example, there is no performance target for improving transit access to jobs, and MnDOT’s target for “state-owned sidewalk miles substantially compliant with ADA standards” is 100 percent by 2037. That’s over 20 years from now! Our state can and should do better. • MnDOT should provide an executive summary to the Multimodal Plan. It is very hard to discern priorities given that the plan is over 112 pages long and is mostly descriptive. This is particularly problematic when you’re asking for members of the public to weigh in. At a minimum, the executive summary should spell out what is different from the previous plan and why. • There are many positives in the plan. These include MnDOT developing an “advancing transportation equity” report, the completion of a Health Impact Assessment, a guiding principle to “build to a maintainable scale: consider and minimize long-term obligations—don’t overbuild,” and newly including data on sidewalks and ridesharing services such as Uber and Lyft. This plan needs improvement. Comment today. >> The plan calculates transit need based solely on transit trips that would serve people who are currently transit dependent. This is a good place to start, but fails to consider the many people in Greater Minnesota who drive today but who would benefit from having transit options. 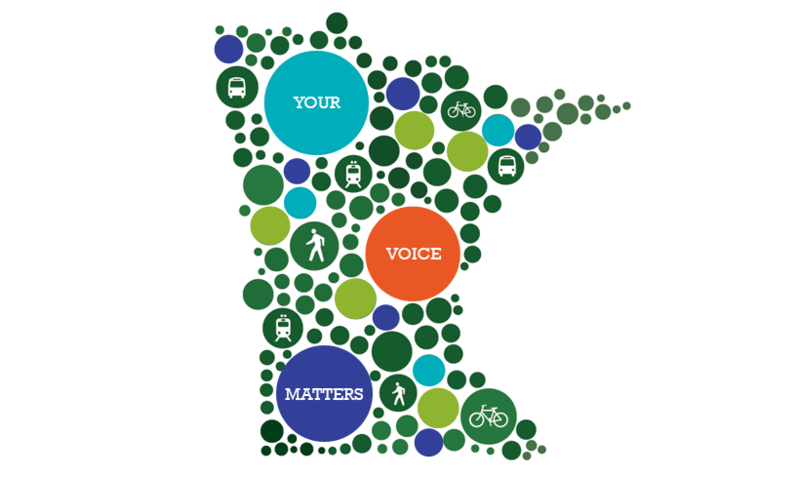 How will MnDOT meet the needs of Greater Minnesota’s aging population? Or of Greater Minnesota families who are struggling to afford the costs of car ownership and operation? Unfortunately the plan does not answer these questions. The plan states that, “Transit riders and non-riders responded that service needs to be reliable, convenient, frequent and connected, in infrastructure and communications” and extensive community input called for “transit to be available when and where it’s needed.” Nonetheless, MnDOT provides virtually no direction on how to attract new riders who would choose transit if more service was available in their communities. >> The plan calculates some transit trip needs that will remain unmet by the proposed level of increased transit service. MnDOT inaccurately assumes that every additional transit trip will align one-to-one with the origin-to-destination needs of transit-dependent riders. Without a transit accessibility measure, we only know that there will be more transit service, but not, for example, that it gets a job seeker when or where she needs to go. • The plan should convey the transit investment gap in the executive summary, not wait nearly 100 pages to do so. Even then, the description of the $114-million investment gap is still rather vague. Does it include both operating and capital costs? Is a 7% increase over the current annual budget sufficient to meet the description of increased transit need? Oddly, the Investment Plan provides no background on past state funding trends or a recommendation for sources of additional state funding. Conversely, the Metropolitan Council describes a half-cent metro sales tax increase for transit expansion in their Transportation Policy Plan. • The plan lacks prioritization and accountability for the 29 strategies that MnDOT will use to advance its six stated transit goals. • MNDOT’s plan for two additional MnPASS lanes should use a take a lane, not add a lane, approach. See the San Francisco study.